As is known to all, savevid is a tool to help you fast and freely obtain video by downloading from all kinds of major video site, such as Dailymotion, Metacafe, Break, MySpace, Facebook, Vimeo, eHow, etc. The main downloading video formats include FLV, AVI, MOV, MPG and WMV. Beyond all question, the first reason for its popularity is that this tool is totally free. Uncharged software is favored by all of us. In addition, the simplicity of use is another reason. The one only needs go through a quite simple step if he wants to achieve video from the website like savevid supporting. That is, copy and paste the video URL into the download bar and then click "download" button to choose a befitting video format and quality. 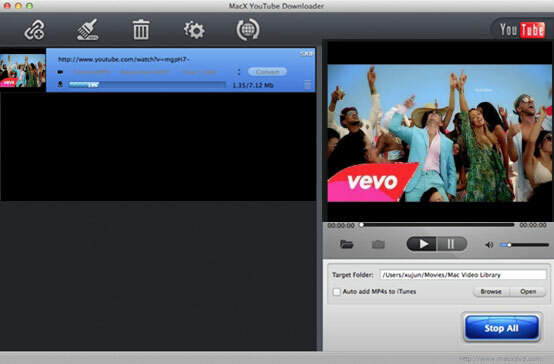 MacX YouTube Downloader, totally free YouTube video downloader to solve the puzzle of savevid not working, is designed for Mac users who want to freely download various videos from YouTube in whatever format or resolution, including MP4, WebM, FLV, even YouTube HD video free download. And surprisingly, it is also capable of automatically adding the output MP4 videos to iTunes Library for transferring to iPhone, iPad, iPod or any other further use. Equipped with multi-threading and batch downloading technology, you can enjoy the amazing downloading speed. We have to admit that this tool is very practical and general. But if you are a senior to use it for downloading videos, to be sure, there were almost 16 online websites supported by savevid from the very beginning including YouTube. For now, savevid supports only 11 websites and YouTube is not in the list. Definitely, with the widely use of YouTube online video website, the majority of Mac users are eager to download video from here and off-line play in order to far from network congestion. So, finding a savevid alternative is a crying need as savevid is not working anymore when facing YouTube. At this concerned moment, you cannot avoid of looking for an effective YouTube downloader in thousands of video editing software even though some of them are built in a number of plug-ins, adware, spyware or virus. Before download YouTube video, you should make sure that savevid alternative Mac has been well installed on your Mac. Open your web browser and find the YouTube video you'd like to download, such as hindi video songs, Karaoke songs, etc; launch this video downloader savevid alternative, copy and paste the video URL to the message box and then click "analyze" or "paste & analyze" button to load video. Select the desired resolution, file size, codec and format like WebM, FIV, MP4, etc. Specify an output folder on your Mac to save the output files by clicking "Browse" button. Click "Download Now" button to start downloading video from YouTube on Mac with the help of savevid alternative. Tips：You can hit on "Auto add MP4s to iTunes" if you want to play it on iTunes when finishing the process of downloading. After the YouTube savevid alternative downloading procedure done, you can enjoy your YouTube videos on Mac without any limitations and can take favorite videos with you on any portable device and watch them while on the move. Of course, if you need some advanced functions like convert video, make photo slideshow and record screen/video, you'd better upgrade to MacX Video Converter Pro for freely editing video.